This is an Escondido pool equipment installation project that also included a new Pentair IntelliBrite LED pool light. We were contacted by this Escondido homeowner to provide installation of his new pool equipment. He purchased the new equipment online and needed it installed by a licensed professional to receive the manufacturer’s warranty. Below is a list of the swimming pool equipment we installed along with a brief description of each component. This pool equipment in Escondido was outdated and non-functional indicating it was time to upgrade. We removed and installed a new Pentair Clean & Clear Plus cartridge filter. Cartridge filters allow for higher flow rates and may extend times between cleaning. This new pool filter is also much easier to perform periodic pool filter cleans as it does not use D.E. 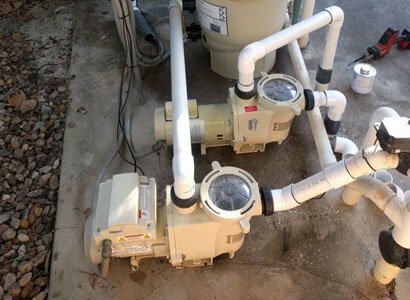 These swimming pool pumps were both old and un-efficient so we replaced the main pool filter pump and spa jet or booster pump. The pool filter pump was replaced with a Pentair 2 VST variable speed, energy efficient pool pump. This will save the customer money on electricity by having the option to run the pump at a much lower speed. The new booster or jet pump was replaced with a Pentair single speed 2hp pool pump ensuring the jets flow was good enough. 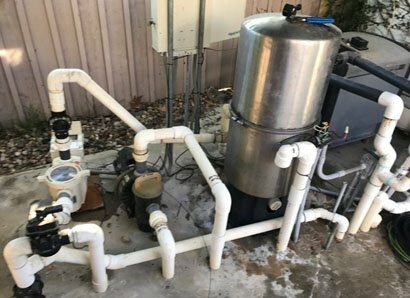 As with all pool pump plumbing, we always add high-temp unions so that you can remove the pump in the future without having to cut into the plumbing. The new pool light installation used the Pentair IntelliBrite 5G LED color changing light that is much brighter and saves money on electrical usage. His biggest upgrade for this pool equipment installation was for the iAqualink upgrade kit. 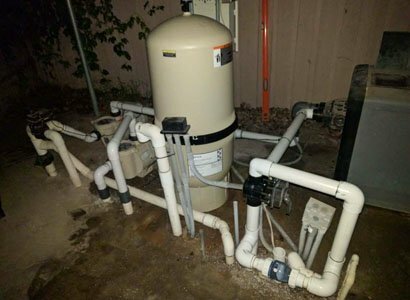 This pool automation upgrade gives this Escondido pool customer the capability of operating his swimming pool or spa with his smartphone, tablet or computer. 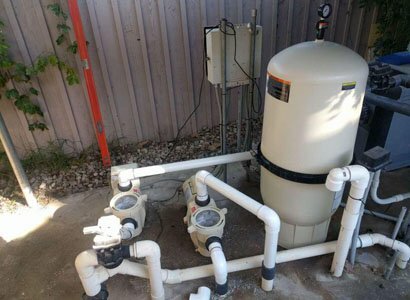 ProTouch Pool Services provided this pool equipment installation in Escondido though we also offer this equipment installation service throughout San Diego County. If you have any questions or need any pool equipment installation help, feel free to call or fill out our contact form.